This section gives a quick (and incomplete) overview of what ASE can do. 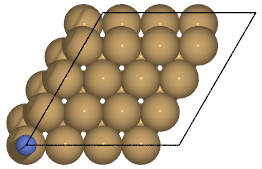 We will calculate the adsorption energy of a nitrogen molecule on a copper surface. This is done by calculating the total energy for the isolated slab and for the isolated molecule. The adsorbate is then added to the slab and relaxed, and the total energy for this composite system is calculated. The adsorption energy is obtained as the sum of the isolated energies minus the energy of the composite system. Please read below what the script does. Many ase.calculators can be used with ASE, including emt, Asap, Dacapo, GPAW, Abinit, Vasp. See the ASE home page for the full list. In this overview we use the effective medium theory (EMT) calculator, as it is very fast and hence useful for getting started. The general documentation on structure optimizations contains information about different algorithms, saving the state of an optimizer and other functionality which should be considered when performing expensive relaxations.